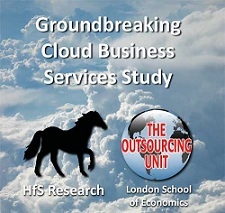 The colossus Cloud Business Services study we just conducted, in conjunction with the Outsourcing Unit at the London School of Economics, has served up some contrasting concerns that business executives are having versus their IT counterparts: Cloud's potential impact on work culture versus its impact on the value of the today's IT department. Essentially, two-thirds of business executives have expressed concern over the impact Cloud business services could have on the speed by which they could be driven to operate in virtual environments. Moreover, a similar number expressed concerns over Cloud impeding their ability to collaborate with other businesses. The bottom-line: when the business execs look at Cloud, they sense a major cultural change in the way they work, while IT executives are terrified by the potential curtailment of their value as the technology-enabler of core business processes. Rather than be in doubt, based on personal opinion or paradigm shift, maybe a controlled limited test case experiment might be in order. Maybe the cloud needs to move from concept to confirmation/non-confirmation. Just a thought. Excellent topic on the cloud. I'm discovering that both business and IT executives are not only sensing but are actively adopting the use of cloud-based solutions in conjunction with their ERP investments to improve working capital and reduce IT spend. For example, cloud applications for Credit-to-Cash optimization will leverage existing ERP investments and present the data through the lens of the individual user. And, rather than IT scheduling costly ERP "customizations" to meet changing business requirements, the cloud application is "configured" by the business users to meet specific and often time-sensitive needs without impacting the ERP system of record. In this context, cloud applications + ERP are enabling a new nimbleness for the business, will not consume scarce IT resources and will provide a significantly lower TCO. Fear is good across both the parties Business and IT. This will ensure controlled progression towards cloud based collaboration rather than adhoc approach. Once Progressive elaboration is done over cloud most of the fears would get controlled and innovative approaches will be found for competition fears and it is high time IT vendors/companies look at business solutions rather than a technological approach. 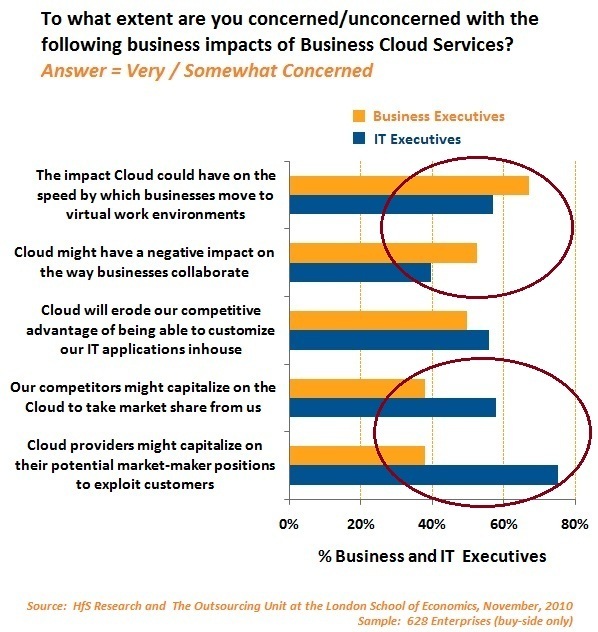 Thanks for sharing the findings on this hot topic, and this looks to be very balanced and excellent reflection of organizations view in terms of anxiety and hope from the cloud business services. While business is more upbeat about cloud as an alternative IT service model the technology investments will certainly need to provide a better value in terms of outcomes coupled with speed & cost. Agreed with Gary that cloud ncessarily needs to leverage the existing ERP investment and some good innovation is already happening in this area. It will be interesting to note the ‘areas’ where cloud adoption is happening faster based on this study.